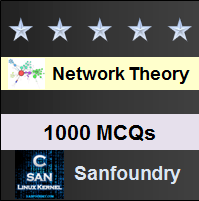 This set of Network Theory Multiple Choice Questions & Answers (MCQs) focuses on “Properties of Driving Point Functions”. 1. The driving point function is the ratio of polynomials in s. Polynomials are obtained from the __________ of the elements and their combinations. Explanation: The driving point function is the ratio of polynomials in s. Polynomials are obtained from the transform impedance of the elements and their combinations and if the zeros and poles are not repeated then the poles or zeros are said to be distinct or simple. Explanation: The quantities P1, P2 … Pm are called poles of N (S) if N (S) = ∞ at those points. The pole is that finite value of S for which N (S) becomes infinity. 3. A function N (S) is said to have a pole (or zero) at infinity, if the function N (1/S) has a pole (or zero) at S = ? Explanation: A function N (S) is said to have a pole (or zero) at infinity, if the function N (1/S) has a pole (or zero) at S = infinity. A zero or pole is said to be of multiplicity ‘r’ if (S-Z)r or(S-P)r is a factor of P(s) or Q(s). 4. The number of zeros including zeros at infinity is __________ the number of poles including poles at infinity. Explanation: The number of zeros including zeros at infinity is equal to the number of poles including poles at infinity and it cannot be greater than or less than the number of poles including poles at infinity. 5. The poles of driving point impedance are those frequencies corresponding to ___________ conditions? Explanation: A zero of N(s) is a zero of V(s),it signifies a short circuit. Similarly a pole of Z(s) is a zero of I(s). The poles of driving point impedance are those frequencies corresponding to open circuit conditions. 6. The zeros of driving point impedance are those frequencies corresponding to ___________ conditions? Explanation: The zeros of driving point impedance are those frequencies corresponding to short circuit conditions as pole of Z(s) is a zero of I(s) and zero of N(s) is a zero of V(s),it signifies a short circuit. 7. In the driving point admittance function, a zero of Y (s) means a _______of I (S). Explanation: In the driving point admittance function, a zero of Y (s) means a zero of I (S) i.e., the open circuit condition as the driving point admittance function is the ratio of I(s) to V(s). 8. In the driving point admittance function, a pole of Y (s) means a _______ of V (S). Explanation: The driving point admittance function Y(s) = I(s)/V(s). In the driving point admittance function, a pole of Y (s) means a zero of V (S) i.e., the short circuit condition. 9. The real part of all zeros and poles must be? Explanation: The real part of all zeros and poles must be negative or zero. But the poles or zeros should not be positive because if they are positive, then they will lie in the right-half of the s-plane. 10. Poles or zeros lying on the jω axis must be? Explanation: Poles or zeros lying on the jω axis must be simple because on jω axis the imaginary part of poles or zeros will be zero.